SOME WOULD SAY that when it comes to SUVs there's now too much choice. However, the upside of the wide-ranging variety is that we don't all end up driving the same vehicle. Take Subaru's Forester  the Japanese carmaker's SUV employs the brand's unique and classically iconic formula of boxer engine and permanent all-wheel drive that endows the Forester with a degree of all-terrain competence that few of its rivals can equal. The Forester boasts clean-cut good looks fronted by a chiselled nose, hexagonal grille and sculpted clamshell-style bonnet, with a side profile that's refreshingly less 'pumped-up' than some of the competition. So while it's unmistakably a Sports Utility Vehicle, it's refreshingly low-key  which will appeal to many would-be owners who want the off-road abilities but not the in-you-face machismo. Swing open the driver's door and you'll be welcomed in by the cabin's clubby leather-rich feel. The wide seats are well bolstered and satisfyingly supportive with plenty of elbow room between them. The trim looks high-grade, with carbon-effect dash inserts and a high-gloss black touchscreen surround. The driver can quickly set the perfect seating position courtesy of full power adjustment  a two-setting memory recall makes his-and-hers driving a civilised affair. As, too, do the two-stage heated seats. The leather-wrapped wheel is good to hold and fully multifunction: lane control, speed limiter, cruise, driver's info display, phone, voice, media, etc. The view from behind the wheel is commanding. Slim A-pillars and a wide and deep front screen ensure a fantastic view over the bonnet and make the Forester a piece of cake to place (not just when parking but also off-road where visibility is as important as traction). The rear screen is also deep and wide with minimally-intrusive rear three-quarter panels, so no problems in that direction either. Add to that generous all-round glazing and an airy glasshouse topped off with a sizeable powered glass sunroof and you have a delightfully airy cabin that's a real pleasure to travel in, be you driver or passenger. A blackout blind and deep sunvisors keep the glare at bay very effectively  the sunblinds also extend inwards to cover the gap either side of the auto-dimming rearview mirror. Driver comfort is further improved by shin-friendly footwells (and you don't have to take off your boots before driving!) and a restful left-footrest finished in non-slip alloy to match the main aluminium pedal set. Many drivers will be pleased to find a trad-style pull-up handbrake but that doesn't mean that you go short on tech: Comms are well served by a seven-inch touchscreen serving up infotainment and navigation and the view from the reversing camera, all with crisp graphics. Press the Talk button on the wheel and you can, for instance, ask for music ("play Bohemian Rhapsody"), set a navigation destination, ask it to search for the nearest petrol station, or set up a call ("phone Nancy"). Music is via DAB radio or Bluetooth; alternatively there's a CD slot and the Aha app. The 3D mapping is sharply detailed with crystal clear street names that are easy to take in both day and night. In addition to a secondary multi-information display set top dead centre of the fascia, the main instrument panel houses foolproof white-on-black main dials either side of an LCD screen displaying prime driving information such as a digital readout of your road speed. The posted speed limit is, incidentally, shown on the main touchscreen. And while plenty of information is good, so too is in-cabin storage of which the Forester has plenty: starting with a large 'cave' at the base of the centre stack there's also dual-use twin cupholders, a decent sized box between the front seats capped by a padded armrest, and bottle-holding door bins along with a good-sized glovebox. Costing �32,5000, the flagship XE Premium Lineartronic model comes well loaded with kit. In addition to the numerous items (4WD, Comms, leather, etc) mentioned elsewhere, there's keyless entry and push button start, dual-zone climate control with anti-dust filter, UV protection glass, powerfolding and heated door mirrors, power windows (the driver's has one-shot op), hill start assist, auto lights and wipes, pop-up headlight washers, windscreen wiper de-icer, tyre pressure monitoring, 'bending' headlights, and 17-inch black alloys. The Forester is also big on safety with a full-fat five-star EuroNCAP rating and twin front, side, and curtain airbags plus one for the driver's knee. Subaru's advanced driver assistance EyeSight system is also standard-fit and uses a dual-camera scanner to monitor traffic and pedestrians as well as maintain a safe distance from the vehicle in front in adaptive cruise control mode; it will also deliver autonomous pre-collision braking to avoid an impact. There's also Lane Sway and Departure Warning, Lane Keep Assist, Lead Vehicle Start Alert (warns you, if you're daydreaming, that the car ahead has moved off), Vehicle Dynamics Control, Trailer Stability Control, whiplash-reducing front seats, height-adjustable front belts, drive-off automatic door locking, and LED headlights. Travelling in the back is usually a passenger's second choice but in the Forester it's likely to be their first  there's generous headroom as well as space for feet, knees and legs. You sit about six inches higher than those up front on perforated leather seats that are both comfortable and nicely supportive, and that with reclining backrests make long trips very agreeable indeed. Nice touches include lower door seals that exclude dirt and mud in bad weather so clothing is kept clean entering and exiting. Other plusses include dedicated AirCon vents and USB charging ports, capacious pouches on the front seatbacks, a drop-down central armrest with built-in shake-proof cupholders, large bottle-holding door bins, and ISOFIX child seat fastenings. Along with the tall glasshouse and big glass sunroof, large third side windows keep the rear cabin pleasantly airy. And with even three side-by-side feeling sociable, the wide cabin is a practical place for family travels; long trips in particular. Subaru is renowned for using 'Boxer' engines  so called because of their horizontally-opposed cylinders that sees the pistons 'punching' past each other as they work. But there is a practical reason to use them: they're flatter so can be fitted lower in the engine bay to keep the car's centre of gravity low, with benefits for handling as well as safety  in a severe crash the Boxer engine simply slides under the car instead of into the cabin. The turboed four-cylinder 2.0-litre Boxer unit powering the Forester revs sweetly and serves up its 147bhp and 146lb ft of torque cleanly. Partnered with a CVT automatic transmission and a sharp throttle response it delivers ample 'oomph' whether you're just pootling or pressing on, hitting 62mph from standstill in 11.2 seconds and running on to a top speed of 119mph. Conveniently sited on the steering wheel are the SI-Drive buttons giving you choice of two driving modes: efficient Intelligent, which you'll use most of the time, and Sport for when you really do want to get a move on. Paddle-shifters on the wheel enable hands-on drivers to take full control of the shifting whenever they please  the CVT automatic offers six stepped simulated gear ratios. A petrol drinker by nature, the Boxer engine's official Combined Cycle figure is 32.2mpg although our full week's testing did better, recording a very reasonable test average of 35.6mpg  not only better than promised, but liveable given the automatic powertrain and permanent all-wheel drive. Suspended on Subaru's all-new platform, the Forester conducts itself on the road with marked composure  body control is well managed, and there's no penalty for having some fun. Of course, the permanent 4x4 is a major factor here, providing plenty of grip and making it a reassuring beastie to put through the twists and turns of an interesting B-road while staying secure and well balanced. There's also a nice 'pointiness' at the nose while the feelsome brakes never leave you wanting for more bite  when asked, the Forester stops impressively. Forget the X-Men; the Forester's got its own onboard 'super-hero' in the form of X-Drive  a whole suite of electronics designed to get the best traction off-road tackling serious mud and, thanks also to an excellent hill descent programme, climbing or descending treacherously slippery slopes. 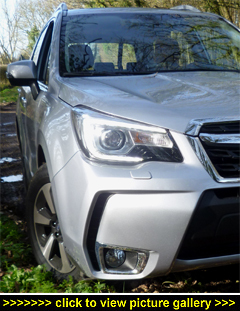 In fact you'll be surprised just how competent the Forester is tackling tricky terrain. It helps, too, that there's a generous 220mm of ground clearance and approach and departure angles that you'd expect to find on a more hardore off-roader (26-degree departure; 23-degree ramp; and 25-degree approach). The excellent all-round visibility, a bonus on-road, is equally welcome, and absolutely essential, away from the beaten track. Combine these positives with the Forester's symmetrical all-wheel drive and you'll soon discover that Subaru's discreet SUV is seriously capable off-road; and more so than many of its in-sector rivals. With its trailblazing character you might not expect much in the way of a caressing ride. Actually, the Forester's ride is agreeably supple, soaking up lumps and bumps effectively on blacktop and off-road terrain with little fuss. No complaints, either, from the 60-profile Yokohama rubber that aids ride comfort as well as providing strong grip. Measuring 4.6-metres nose-to-tail, the Forester's cargo space can be pretty accommodating  drop the 60:40-split rear seats and you'll have a 1,557-litre loadbay with a flat, seamless floor. It also benefits from a load-compensating rear suspension, so safely carrying heavy loads is well within its remit. Accessing the golf bag-swallowing 505-litre boot and loadbay is as easy as it gets thanks to an ultra-wide powered tailgate that's quick to open and quick to close using the key-fob or the dash switch. Handily, the opening height can also be adjusted. Lift the floor panel and you'll find a selection of handy storage trays. Another useful feature is the large rear doors: they open to 90-degrees and not only make entry and exit �ber-easy for passengers but are very practical when loading/unloading the cargo bay. Should you prefer to tow your cargo, the Forester will pull a braked 2,000kg. Plus there are roof rails for overspill luggage on those family staycations.